A carry purse should have a dedicated compartment that holds only the gun and also keeps the firearm indexed so you’re able to get your hand on the gun in a proper firing grip more or less instantly. Uneducated purse carry is, at best, akin to driving around with a spare tire in the trunk but not knowing how to fix a flat. At worst, it’s like driving on a busy highway while texting. So for those who are considering this carry style, here’s an introduction. First, get a proper purse—one that has a dedicated compartment and sleeve or holster for the gun. A handgun should never be carried loose in a purse along with other objects, and these sleeves or holsters will prevent objects from entering the trigger guard, where they could cause the gun to discharge. A dedicated holster compartment within the purse offers more than just trigger protection. When the position of the inside-purse holster is chosen correctly, it positions the handgun in a manner that allows the wearer to obtain a firing grip on the gun—trigger finger straight and on the frame, not around the grip and not on, or in, the trigger guard—while it’s still concealed. If the access hole is too small or the gun is too large for your hand to reach in and comfortably establish a firing grip as well as draw, your chances of being successful in a defensive encounter are slim. Most holster purses secure the gun area with a zipper. If yours doesn’t have a handle of sorts on the zipper fob, make or get one. It can be a pretty tassel, a large keychain—anything you can grab in a fist to yank the zipper open in a hurry when under stress. So that’s step one. Step two is maintaining control of the gun—keeping the purse away from not just thieves but also kids. In both cases it’s a matter of maintaining physical control of it all times. When it comes to being the target of a thief, it’s about security of the purse, and some holster purses makers use slash-proof shoulder straps for this reason. Which brings us to the question of how to carry the purse. It’s a good idea to keep your firing hand free as much as possible when in public, regardless of your carry method, and some women feel most confident carrying with the purse strap across their chest—purse and gun hanging on the firing-hand side. 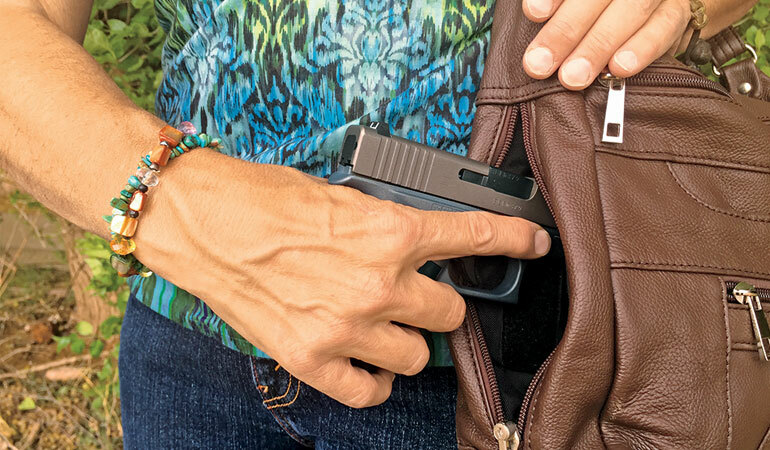 While across-the-chest carry of the purse does keep both hands free and keeps the gun under your control, it can prove a difficult position to draw from without practice. On the other hand, it keeps the firearm easily under the wearer’s control and eliminates the possibility of leaving the purse behind. Carrying on the off-side shoulder leaves the firing hand free but reveals new dangers—namely sweeping your arm or wrist during the draw or when holstering. Also inherent in any cross-draw situation—drawing the firearm from a position on your non-shooting side—is the potential to sweep bystanders during the draw. Another risk of single-shoulder carry is that unless you’re firing strong-hand-only, the purse is likely to fall off your shoulder, causing the strap to hit your off-side elbow—possibly moving your shot off the mark and striking an innocent bystander. Regardless of how you carry the purse, it’s important to remember the average criminal attack is less than five seconds in duration. Can you get your hand into your purse, draw, and shoot accurately in that amount of time? One thing that cuts down your response time is staging the gun if an attack seems imminent, having a firing grip on the gun while it’s still concealed. Both drawing and staging can and must be practiced, and a great way to do this is through dry-firing—using an unloaded gun at home, double- and triple-checking that it’s unloaded, with no live ammo even in the room where you’re dry-firing. You must work out a draw that doesn’t cause you to muzzle yourself or others, while consistently keeping your trigger finger planted on the frame of the gun until sights are on target. Pay special attention to where your muzzle is at all times, from the moment the trigger guard is no longer covered by the inner holster to when the gun is pointed at the target. Sure, it’s no big deal if the muzzle’s aiming at the toilet as I dry-fire in the privacy of my bathroom. But what about performing this same draw in the parking lot of the local grocery store, at church, at the movies? Be honest with yourself if your finger or muzzle control aren’t perfectly compliant with safety rules. Remedy anything that isn’t. You should also become skilled at firing strong-hand-only, as well as smoothly dropping the purse during the draw so your aim in a two-handed hold isn’t impacted by the purse falling and hitting your support-side elbow. For the latter, when carrying the purse on your non-shooting side, stabilize it with a palm-up position where the strap and purse body meet. This way the purse can fall smoothly away just after the draw. Safe and effective purse carry takes knowledge and practice. Take the time to find instruction if you can, but find a reputable instructor or resource; there’s plenty of misinformation out there. If a resource doesn’t strictly follow the four basic rules of gun safety, pass.